"'Live Like Fred' is an idea started by me and my mother. We decided to go around the Pittsburgh area and interview people whom we call inspiring neighbors. I hope to continue to encourage everyone, young and old, to live like Fred." I chose Point Park because of the opportunities and connections it has outside of the classroom. Since I am a broadcast reporting major, it is very important to find ways to get a foot in the door and gain hands-on experience through internships. When I found out about all of the connections Point Park has with internships and how freshmen can get involved right away with student media, I knew this was the school for me. I wanted to get involved immediately to get as much experience as possible for my career. I got involved as much as I could when I first arrived on campus. I am a reporter/analyst for U-View's Pioneer Sideline and The Halftime Show, co-host of CJ/RJ Sports Point on WPPJ and a play-by-play/color commentator for Point Park Sports Network. Additionally, I am in the Honors Program and a member of the Honors Student Organization. "Proud to be from Pittsburgh: 'Live Like Fred,'" WPXI-TV. "Pumpkins, flowers spread Fred Rogers' message of kindness," TribLIVE.com. "'Live like Fred' spreading positivity on social media," KDKA-TV. You are an extra in the upcoming movie about Mister Rogers. Tell us all about that experience. Being an extra in the upcoming film was an experience unlike anything else. It was a dream come true for someone who loves Fred Rogers as much as I do. Along with other extras, I was fortunate enough to film a short scene with Tom Hanks as Mister Rogers. Dressed in a 90's style sweater and my dad's vintage jean jacket, I saw the true spirit of Mister Rogers come to life. When I started the 'Live Like Fred' campaign, I never dreamed it would give me so many amazing experiences such as this. It also made me proud to know that I am representing Point Park University in the movie. We'll see if my scene makes the final cut when the filmed is released in October 2019. Either way, it was an experience of a lifetime and one that I will never forget. 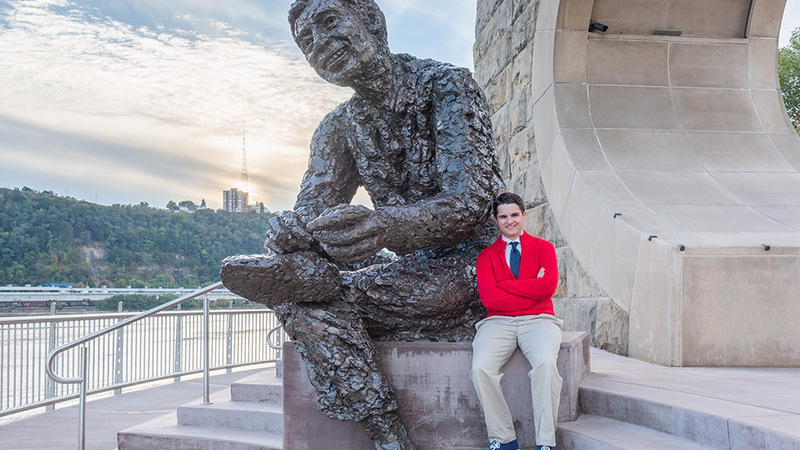 It has motivated me to continue on with our mission of spreading kindness and love just as Mister Rogers taught us. I hope to continue to encourage everyone, young and old, to live like Fred. What’s your favorite part about living in Downtown Pittsburgh? The thing I enjoy the most about living in Pittsburgh is knowing that I can go to a Penguins, Steelers or Pirates game whenever I want because of how close all of their stadiums are to campus. I love the city atmosphere and am excited to be part of it for the next four years. Where is your favorite spot to hang out on campus? The library at the University Center is a quiet place to get homework and studying done. I especially enjoy the study rooms because you can focus on your work without any distractions. I also enjoy relaxing at Village Park because it is a nice way to get some fresh air while studying. What advice would you give incoming to students? The advice I would give to incoming students is the same advice I got before I came here: get involved. Getting involved is very important because that is how you make friends, regardless of your major. The Campus Activities Board hosts very fun events, along with the various clubs the student body has to offer. I made friends quickly by going to events and joining U-View, WPPJ, and the Point Park Sports Network during my first few weeks on campus. Also, get prepared to study really hard while also enjoying the best four years of your life.